OKENYO is one of Australia’s most adventurous new avant ‘n’ B acts. Lately she aired 10 Feet Tall – architectural electro-soul carrying a message of empowerment. 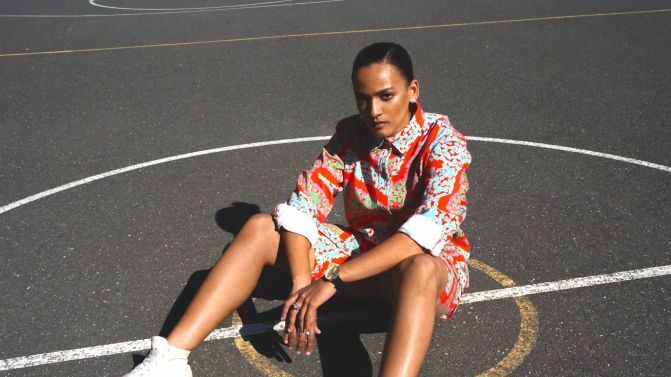 The Sydney singer/songwriter connected with Adelaide producer BadCop (aka Mario Späte), best known for helming Tkay Maidza’s Brontosaurus. Yet, for all the blog buzz, OKENYO’s origins are mysterious. In fact, she has a whole other life as Zindzi Okenyo, actor. A NIDA graduate, she has worked extensively with distinguished theatre companies. In 2013 OKENYO became a presenter on Play School – she even sings on the show. OKENYO started composing songs seriously after experiencing heartbreak. Influenced by Grace Jones, ’90s neo-soul artists like Erykah Badu, and the illwave Frank Ocean, she’d forge her own alternative sound. OKENYO has also referenced her African-Australian heritage (Mum is Australian, Dad Kenyan). Sharing her music online, OKENYO first attracted attention with 2013’s raw Broken Chest. Last year she offered Just A Story, with the indie twang of Santigold. It was accompanied by a stunning narrative video, revealing her dramatic flair. This past April OKENYO announced that she’d signed to Elefant Traks, the label run by Tim “Urthboy” Levinson (she calls it “ET”), unveiling 10 Feet Tall. OKENYO had already cameoed on Urthboy’s single Second Heartbeat alongside Sampa The Great (complete with Collarbones remix!). Since then, she’s been on the road with him and L-FRESH The LION on a huge, staggered national tour – many dates selling out. OKENYO has long touted an EP – and, she promises, it’s coming. In the meantime, OKENYO will launch 10 Feet Tall with a special gig at Sydney’s Oxford Circus in early July. Expect surprises. Music Feeds: You’re just winding up the Urthboy tour. How’s it been going? OKENYO: Yeah… It’s so fun. I was actually talking to my manager this morning and just saying that Urthboy – I think it’s rare, but he’s really egoless! It’s obviously his tour, but he’s such a welcoming guy. It really feels kinda like a whole family vibe where everyone’s doing their thing, rather than supports being separate. It’s really fun. It’s good. MF: You have a band, don’t you? OK: I’ve been through a few iterations of the band. I started out with four guys, and then I had two. But actually on this tour I’m doing it solo. It’s been a really cool experience. It was just a practical decision and a creative thing to go, Okay, let’s see if I can do this myself – and it’s working and it’s really fun. So this tour is just solo. I don’t have any band with me – it’s just me and a few instruments and stuff. MF: Your bio is very much based on the music you’ve released and the shows… So I started gleaning things from old interviews. I found out that you lived in New York as a teenager. What took you there? OK: Yeah. Throughout my high school years I lived in Hobart. I went to a Quaker school there called The Friends’ School – The Society Of Friends, that’s what the Quakers call themselves. The one in Hobart is the only Friends school in the Southern Hemisphere but, actually, there’s lots of Friends schools everywhere – like heaps in the United States and Japan and all over the world. So I went to that school in Hobart. There was a teacher that came over from Friends Seminary in NY, in Manhattan – and I’d always wanted to go [there]. It wasn’t a proper exchange – I just spoke to her and said, ‘Do you reckon I could come over?’ My Mum supported me and I went over and lived there for I think about six months when I was 16. It was amazing! I just remember it being so liberating. I’d travelled a bit, but not really. To be in a city like NY when you’re 16, I just felt so independent (laughs) and I was so inspired. So that’s what took me there. MF: That solves another mystery, because I then realised that you were quite an experienced actor. But I found that your first stage role was in A Christmas Carol at The Theatre Royal in Hobart in 2003. OK: Yeah! My first professional show was at The Theatre Royal – that’s right. Then whilst I was doing that show actually I got accepted into NIDA, the acting school here in Sydney, so I did that for three years full-time. So music is quite a recent endeavour of mine – ‘recent’ meaning the last three years or something. But I’ve been a professional actor for 10 years now. That’s mainly what I do. In the last three or so years I’ve started to expand on my creativity as an artist and explore different sides of myself. MF: You have done so much impressive work as an actor – recently doing The Golden Age with the Sydney Theatre Company. And you have Play School as well! How are you balancing music and acting? They’re very different worlds. OK: Actually, at the moment with this tour and the recent signing to Elefant Traks, it’s the first time that I’ve really been juggling both of them. To be really frank, in the beginning it was a little bit overwhelming – ’cause I was like, Okay, what have I got myself into? In order to be really creative, to be really fruitful in your creativity, you need to not be exhausted all the time. So I was wondering how that was gonna go, ’cause I’ve been doing theatre pretty much all this year and shooting Play School and everything. But, actually, it’s great – I’ve settled into a real rhythm. It really suits me because, for example, I just finished a play [Good People] at the Ensemble Theatre company over in Kirribilli – and that was a naturalistic American piece, kinda like round-room drama – and then, as soon as I finished that, I’m on the road with Urthboy and then, when I come home, I do Play School. And so they’re like really polar opposite worlds. It’s hilarious in a way to go from the hip-hop world straight to singing nursery rhymes (laughs), but for me it works really well. I just make sure that I am eating well and staying healthy and try to find time for myself to relax and things like that. But I really love it – I really thrive on being busy and having my brain working in different ways. I’m probably a little bit crazy! MF: Once upon a time, when actors put out records, people were a bit cynical and thought of it as a vanity thing – I think it was the J-Lo effect. But now it’s totally natural – we’re in the slashie era. OK: Yeah, it’s true… Even when I started to write music, I know people were like, ‘What – have you given up acting now?’ It’s like, ‘No, I’m just doing both things.’ But I think you’re right – that idea of the slashie, in the beginning, a few years ago, it was a bit like, It’ll just kinda confuse people. But I think it’s happening more and more now that it’s becoming more acceptable that you can just be an artist and that might manifest in any way, shape or form. MF: How did you come to sign to Elefant Traks? It’s such a fluid label – it has so many different styles on it, from the dance Hermitude through to the indie Jane Tyrrell. It’s certainly not a hip-hop label. OK: Well, it’s exactly that – what you’re talking about. The thing that really excited me about the possibility of signing with ET was that Tim, Urthboy, his interest in signing an artist like me was to expand this idea that ‘Aussie hip-hop’ or ‘Aussie R&B’ or just being an Australian in the kinda ‘urban music’ landscape can be so many different things. An artist like L-FRESH The LION [or] Jimblah – they’re both [offering] quintessentially Australian points of view, but obviously they’re not white Australian and they’re also different – both of those examples are different ethnicities. So you’ve got these different kinds of stories coming out of what it is to be Australian. That was really exciting to me. I was astounded the day that it was announced that I was an artist on ET – all the artists really welcomed me and everything. I just feel like that probably doesn’t happen on every record label (laughs) – people going out of their way to be like, ‘Welcome to the family’. It’s cool ’cause I’d been kinda juggling and looking at other labels for a long time – big and small – and I feel like I’ve made a really good choice. MF: 10 Feet Tall is an epic electronic number. How are you developing your sound – and how does this record with BadCop fit into the scheme of things? OK: The 10 Feet Tall was an interesting one. It came about through a songwriting intensive called 50 Songs In 5 Days. In the intensive you get put with different people every day and you have to come up with a song by the end of the day. It was great ’cause you’re really pushed to write – you just churn out material. I got put with Mario, BadCop, and we got along really well and we just made this song. Then, when my management and ET heard it, they really loved it, so we decided to go for it for the next single. It’s different to my other stuff in the way that it is very electronic. It’s my first thing where it hasn’t been produced by me in any way. I’ve had no part of the production side of it. But Mario’s so amazing and it just kinda seemed to make sense, which was cool. It’s cool because there’s been a lot of, like, people can’t necessarily see where my music fits in what genre – and I’m fine with that. I’m just following what my instinct is and I don’t really mind if that takes me into different genres – like travelling with these hip-hop artists at the moment, that’s been really inspiring. Tim’s been encouraging me to write raps and things like that. So I’m just exploring. It’s good ’cause I think that definitely my next stuff is gonna be more buoyant and positive – maybe not so reflective… At the moment there’s so many terrible things happening in the world, and there’s a lot that I’m quite upset about, and [I] don’t know how I can help or whatever and so I’m just focussed on writing music that injects positivity back into the world. MF: Are you working towards an album? OK: Yeah, yeah, absolutely – the first thing with ET is that I’m gonna bring out an EP with them. But definitely after that I’m working on an album also. MF: Do you have any timeline for it? OK: Yeah, hopefully next year for an album, for sure – definitely an EP later on in the year. So it’s pretty exciting. MF: That just shows you how keen we are. It’s not a ‘pressure’ question – it’s an ‘enthusiasm’ question. OK: Yeah, thank you (laughs). No, it’s cool – ’cause the songs that I have out at the moment, I wrote them a really long time ago. I still love them but, at the same time, I’m really excited to explore what’s gonna happen in the future and work on some new material and share that with everyone. MF: Who are the artists you’re feeling at the moment? OK: At the moment probably my favourite album is an album by an [North] American producer called Kaytranada [99.9%] – it’s a really, really great, really versatile album. I suppose he’s kinda electronic… He’s done some tracks for The Internet and people like that, so there’s an R&B, soul element to it as well. Also L-FRESH has one rapper who performs with him called MIRRAH and she’s amazing. She’s about to bring out an EP – so that’s something definitely to look for. She’s a rapper and a soul singer. MF: You have the single launch coming up in early July. What can punters look forward to? OK: I was actually just planning some stuff today. I’ll be doing my solo version of the show, but I’m trying to gather a good team of interesting, inspiring women to give people a bit more of a show to come to. Hopefully there will be some back-up singers and perhaps some dancers – and [then there’s] a friend of mine, DJ Chanel, who’s gonna be on just before me. So it’ll be obviously inclusive of everyone, but a really cool female-heavy night showcasing some really awesome people that I know and great artists. MF: Will you convince any of your actor friends to come? Or do they stick to their own world? It’s a different world – whereas in the music world you’re used to starting the night late. But, yeah, I’ll have all my friends there, which is really cool. MF: Do you have any theatre productions coming up? OK: Yeah, I do, actually. I’m going over to Melbourne for a few months to do a show with [the] Melbourne Theatre Company – it’s called Disgraced [Ayad Akhtar’s play about negotiating cultural identity and Islamophobia that won 2013’s Pulitzer Prize for Drama]. It was just on recently at Sydney Theatre Company, but this is a completely different production. Nadia Tass is directing and Kat Stewart’s gonna be in it and some other people. So that’s gonna be opening mid- to late August at MTC.